Card College Lightest is the final volume of Roberto Giobbi's acclaimed 'Light' trilogy. In it are taught 18 thoroughly astonishing tricks of professional quality, complete with performing psychology, presentations, valuable tips and insights, all of which contribute to making these sleightless effects into near miracles. Roberto Giobbi is acknowledged worldwide as the finest living teacher of card magic. His Card College series is a best-seller in five languages, and Card College Lightest is the newest example of why he and his works are held in such high regard by magicians of all levels, from rank amateur to seasoned professional. If you have read his (e)books, you will need no urging to buy Card College Lightest . If you have yet to encounter Roberto Giobbi, you will find Card College Lightest a delightful introduction. 1st edition 2010; 152 pages. Why are greater books sold for less? 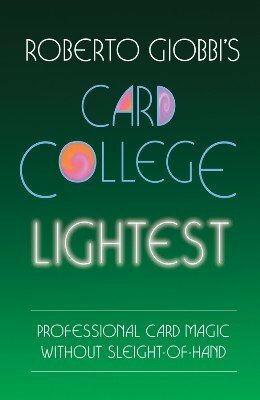 Card College Lightest may be a fine read but no digital file is worth $26.